ESASky gets more international with its latest release, which features the possibility to enjoy all its functionalities (in both Explorer and Science mode) in Spanish. We thus expand the application to all scientists, students and Astronomy enthusiasts of one of the biggest language communities of the world. This new version is also accommodating colour-blind users thanks to a new colour palette in the data treemaps. ESASky v3.1 also features a pagination of the data panel –making it easier to navigate– and improved model and metadata of the Solar System Object (SSO) functionality. The built-in target lists have been updated and new object lists have been added for users to enjoy. This version also presents several technical improvements and minor bug fixes. Please refer to the release notes for more information. The ESASky development team welcomes feedback from users via the ESASky UserEcho forum to continue improving the application and making it a more useful and efficient science and outreach tool. The datasets from both collections are now synchronised in the three available archives. The Planck Catalogue of Non-thermal Sources is now available, together with several updates in the archive interface. User space has been increased to 20 GB, and new external catalogues have been added. In the meantime, many new exciting scientific results with DR2 data have been announced. These data deliveries have coincided in time with the publication of new scientific results from both missions. The latest release features on-demand inventory plots and improvements of the user interface. The conference, which seeks to optimise the impact of multi-source space data, took place on February 19-21 in Munich. Since mid-March 2019, users of ESA’s Hubble Space Telescope (HST) archive (EHST) can query the Hubble Legacy Archive (HLA) collection fully synchronised with the HST archive at the Canadian Astronomy Data Centre (CADC). The HLA is a joint project of the Space Telescope Science Institute (STScI), the former Space Telescope European Coordinating Facility (ST-ECF), and the CADC. From this data collection, the EHST contains enhanced image products for WFPC2 (produced by the CADC) and ACS, NICMOS and WFC3 (produced by the STScI). Spectroscopy will be added very soon. Contrary to what was happening previously, when every archive (the EHST, the Mikulski Archive for Space Telescopes (MAST) at the STScI and the HST archive at CADC) processed the raw Hubble data, users can now be sure of finding exactly the same public data in all three data centres. This is the result of the collaboration between the three partners within the common HST Consolidation of Pipelines project. Huge effort has been made in building and re-engineering several systems, leading to a more robust archive, easy to maintain and to extend. All the layers in the software, from database and repositories to the web user interface, have been updated. The synchronisation was already available in all three archives since June 2018 for the data from the HST collection, which contains all public standard-processed data from the active HST instruments (ACS, COS, STIS, WFC3) as well as from the legacy instruments (FOC, FOS, HRS, NICMOS, WFPC, WFPC2). In February 2019 the Planck Collaboration has released via the Planck Legacy Archive (PLA) a new product, the Planck Catalogue of Non-thermal sources, a catalogue of sources selected at the lower Planck frequencies and characterised at all Planck bands. Further details about this catalogue can be found in the associated article. At the same time, a new release of the PLA interface has taken place, extending the archive capabilities by allowing the subtraction of additional PR3 CMB and Galactic foreground emission maps from any frequency map. The map-making tool has also been improved, allowing users to take advantage of the flagging information contained in the time-ordered data to make maps with data that has not been used in the official Planck maps (for example, observation of planets and other Solar System objects). The "map cutout operations" section has been updated to include simple statistics from the map cutouts. An embedded ESASky frame has been added to the results page, showing the selected map centred in the same coordinates as the preview image, but with a larger field of view. In addition, a search by file name has been added to the home page allowing direct access to the PLA products. Gaia DR2 continues providing surprising scientific results, from the recent confirmation of the cooling sequence of white dwarfs predicted 50 years ago to a new estimation of the motion of the Andromeda Galaxy that changes the time and details of its future collision with our Milky Way Galaxy, through several studies of galactic clusters that not only discovered many new clusters, but showed that some of the previously known clusters do not actually exist. In preparation for the third data release, which has been splitted into two parts (an early release in the third quarter of 2020 and a full release in the second half of 2021), the Gaia Archive team is continuously working to improve the functionalities of the Gaia Archive. From February 2019, all Gaia registered users have an increased personal space of 20 GB. Apart from several other improvements which are described in the release notes, some new external catalogues, RAVE DR5 and APASS DR9, were included as well. Some tips and tricks for the Gaia Archive are summarised here. Several tutorials and data access recipes are available from the "Help" tab at the Gaia Archive, and support is provided via the Gaia Helpdesk. Planetary missions continue their regular deliveries of data to the Planetary Science Archive (PSA). In the latest months, the archive data holdings have increased with new Mars Express and Rosetta datasets. The newly derived Rosetta data include ROSINA calibrated data at different levels (L3, L4 and L5) for the whole comet phase, and 207 OSIRIS CODMAC datasets straylight-corrected, reflectance-corrected and both straylight and reflectance-corrected data. 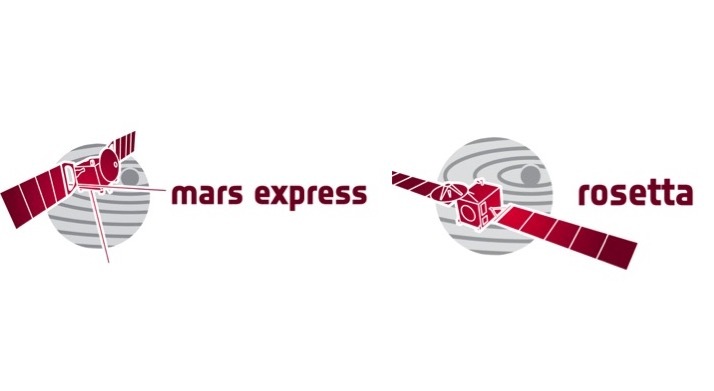 The last Mars Express deliveries include ASPERA-3 NPI and ELS raw and calibrated data through June 2018, as well as MARSIS subsurface raw data through December 2017. HRSC map-projected data through December 2017 and radiometric data trough June 2018 were also delivered. The deliveries have coincided in time with the publication of new scientific results from both missions. 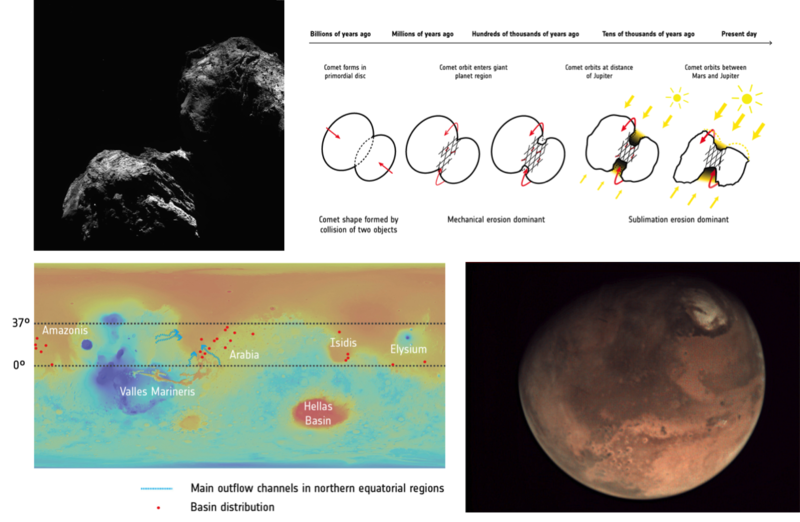 On one side, Rosetta’s OSIRIS high-resolution images have revealed that some geological features of Comet 67P/Churyumov–Gerasimenko were created by shear stress, which acted globally over the comet and, crucially, around its neck. Fractures propagate deeply into the comet’s interior, suggesting the material in this part of the object is frail and breakable. These results shed light on how dual-lobe comets have evolved over time. On the other side, data from Mars Express’ HRSC instrument have been key in the recently published study of the red planet’s groundwater system that found the first evidence of a planet-wide system of ancient interconnected lakes on Mars, further deepening in the understanding of the past history of one of our closest neighbours. The new version (2.2) of the Cluster Science Archive (CSA), released on 28 February 2019, now enables users to create on-demand inventory plots, i.e. for any time period and dataset. Cross-calibration pre-generated plots are now fully in sync with the Cluster Science Operations Centre (SOC) at ESAC. These plots are 1-hour long, pre-generated for the full mission, allowing users to visually compare the same physical quantity (electron density, DC magnetic and electric field, etc...) measured by different experiments on each spacecraft. The CSA graphical user interface has also been improved to ease the search and data visualisation on a 13-inch screen. The 2019 edition of the annual Big Data from Space (BiDS) conference took place on February 19-21 in Munich, Germany. The conference brought together more than 500 people from major European organisations, including research and industry institutions, with the goals to promote research and applications in innovative data analysis methods, to favour the exchange between similar works in different data intensive domains, and to advance new solutions from research and development to operational use (e.g. for the security domain). All to maximise the impact of multi-source space data for scientific exploration, commercial exploitation, and societal benefits. The European Space Astronomy Centre (ESAC) had an active role in the meeting organisation and was well represented at the conference, with several contributing talks and posters presenting the ESDC work on distributed databases for the science archives and the future Science Exploitation and Preservation Platform (SEPP). Some of the most discussed topics were machine learning and time-series analysis implementations, for which training datasets are demanded. Different big data landscapes were presented by different speakers. It was pointed out that scientists are requesting not just to be provided with good data, but also analysis-ready services.